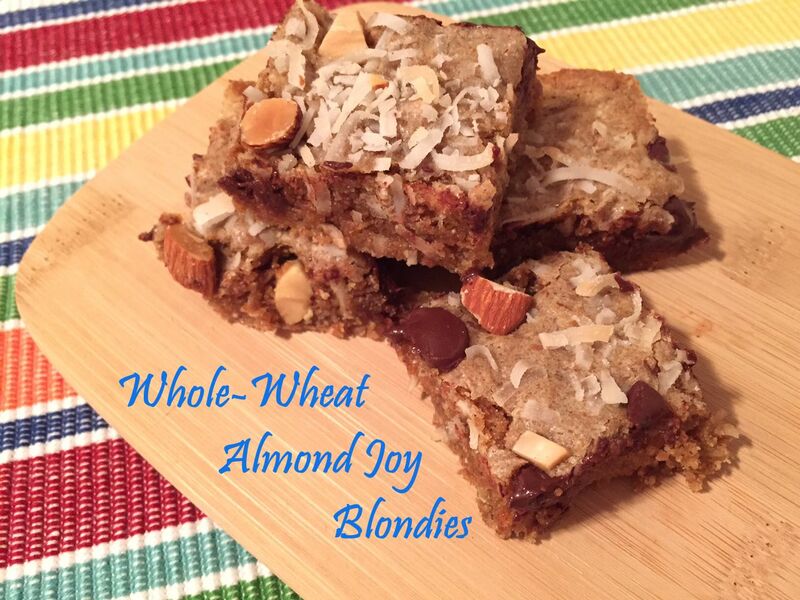 In the meantime, I can make this delicious whole-wheat version to satisfy my sweet tooth in a slightly healthier way. 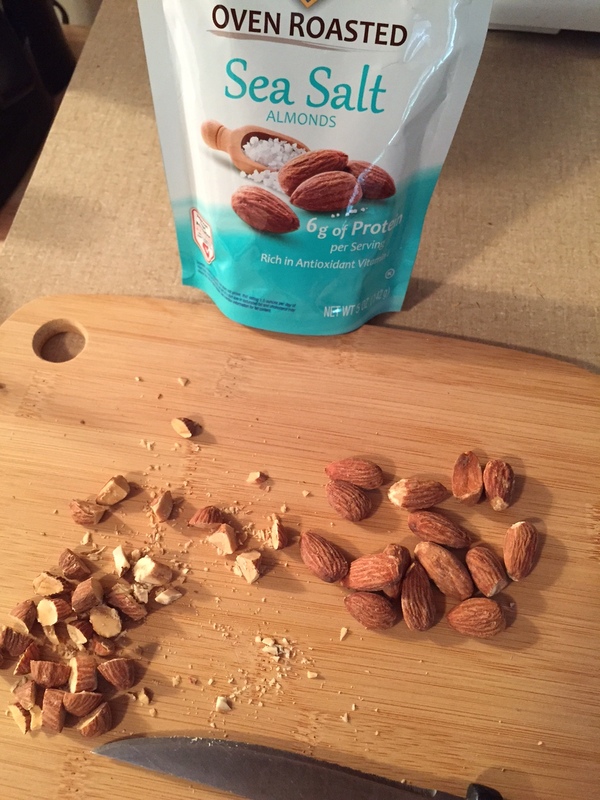 I decided, rather than stick with the safe chocolate chip version, to kick these up a notch by adding chewy coconut and crunchy Blue Diamond Sea Salt almonds. 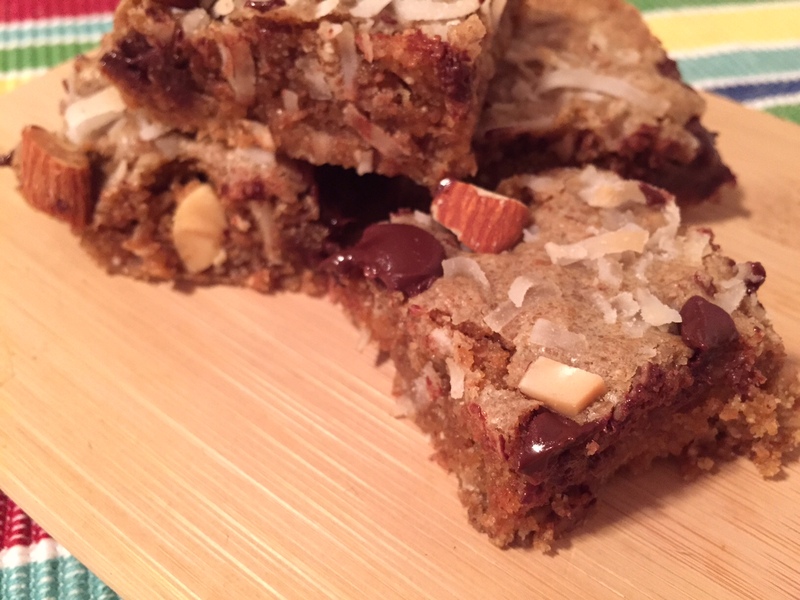 I also used dark chocolate to make them even more decadent. 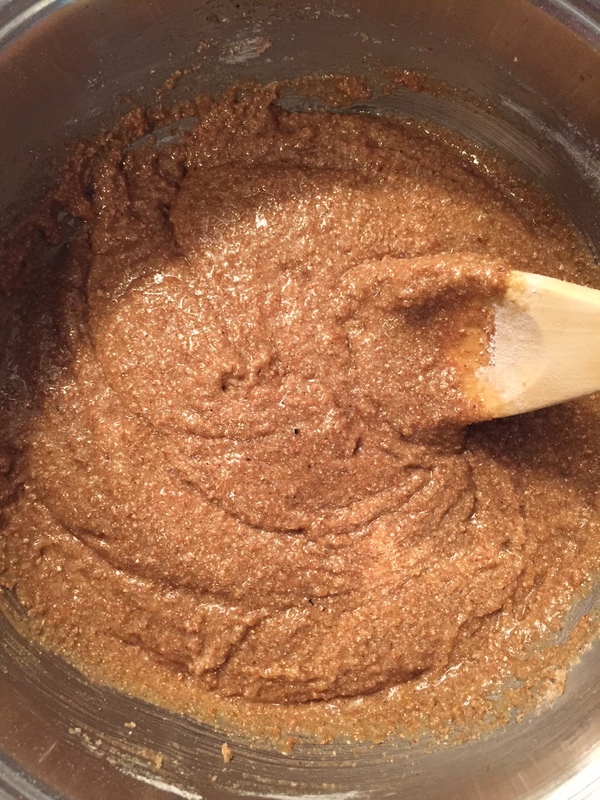 Keep in mind that these do still have butter and brown sugar; however, they have less sugar and calories than a normal blondie as well as more nutrients from the whole-wheat flour. 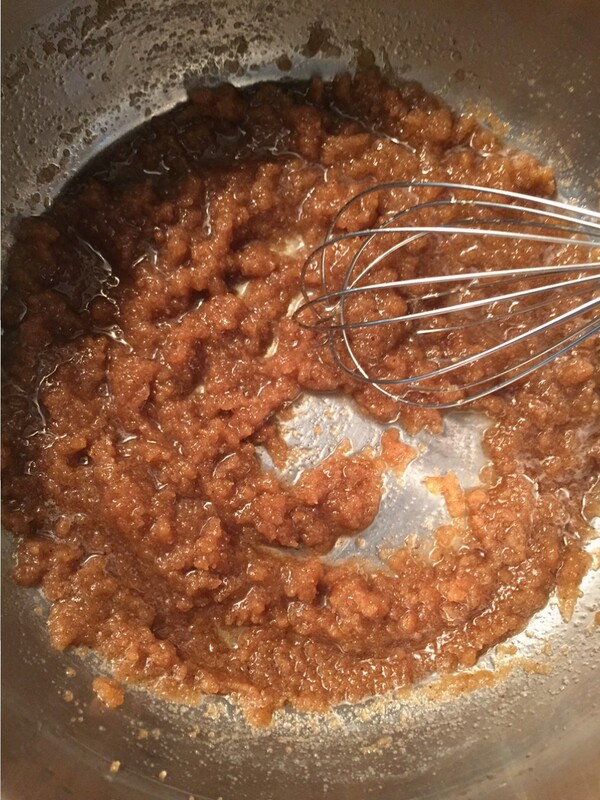 The key is to brown the butter first to give it more flavor, and it certainly succeeded! 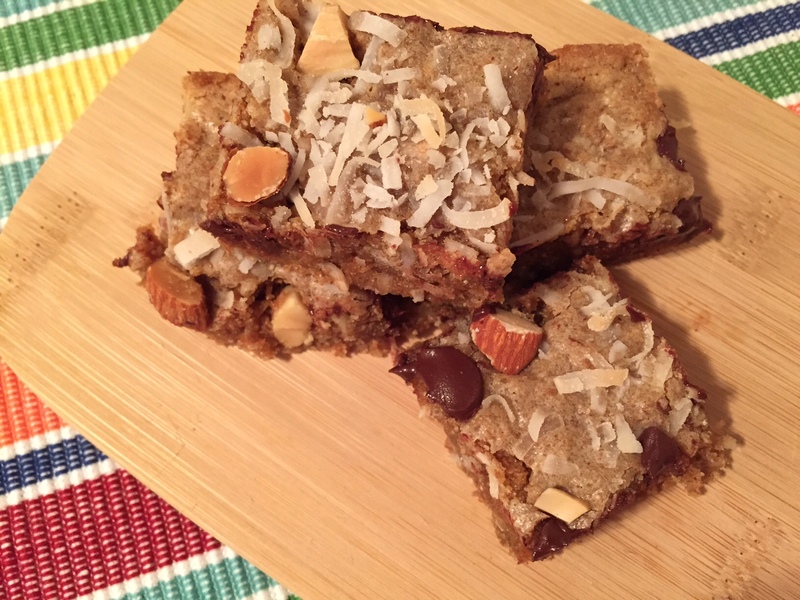 These are chewy, soft, and delicious, and they were also a hit at a potluck with some friends this week. 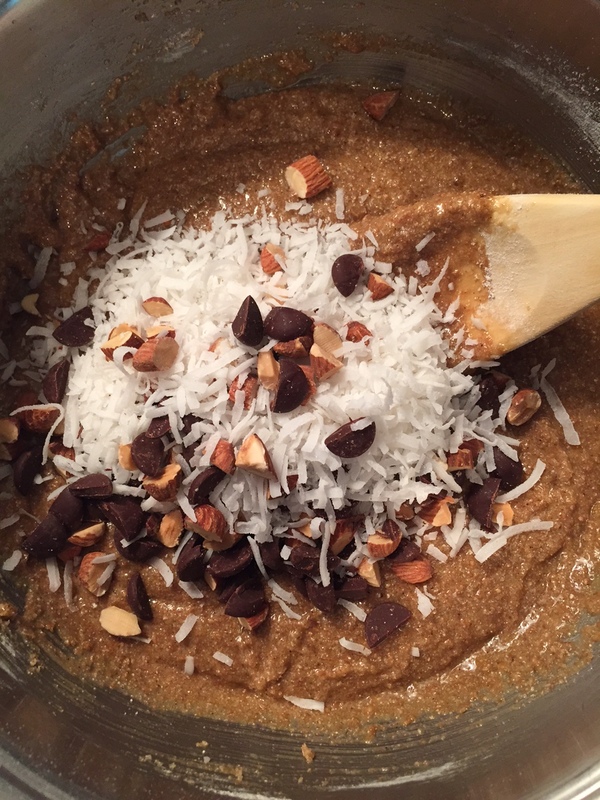 Feel free to switch up the add-ins by using more nuts or adding dried fruit, white chocolate chips, etc. Enjoy! 1.) 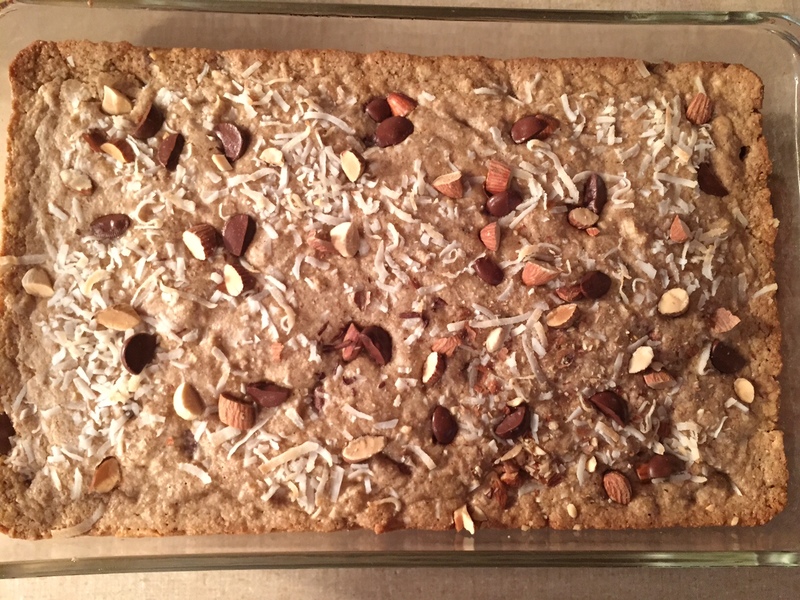 Preheat oven to 350 F. Spray a glass baking pan (about 9 x 13) with coconut oil cooking spray. 2.) 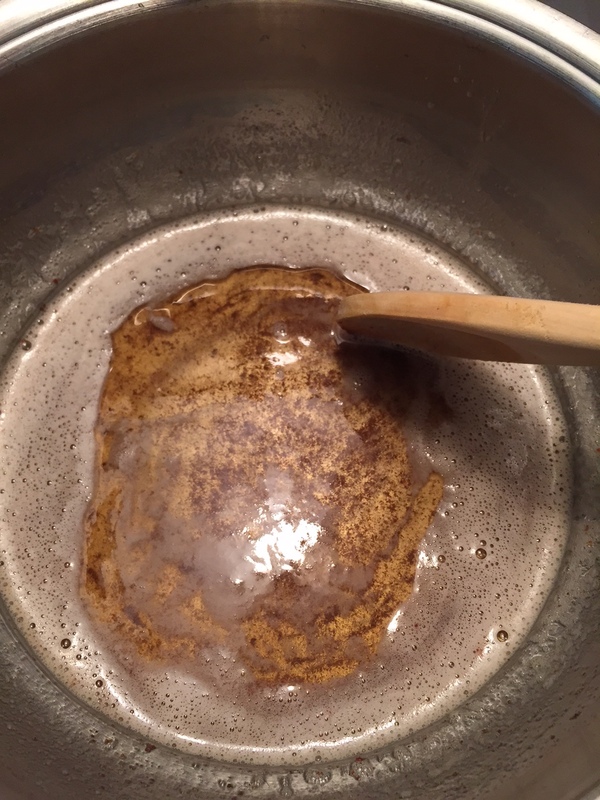 Melt butter in a large saucepan over medium heat, stirring often, until fragrant and starting to brown. 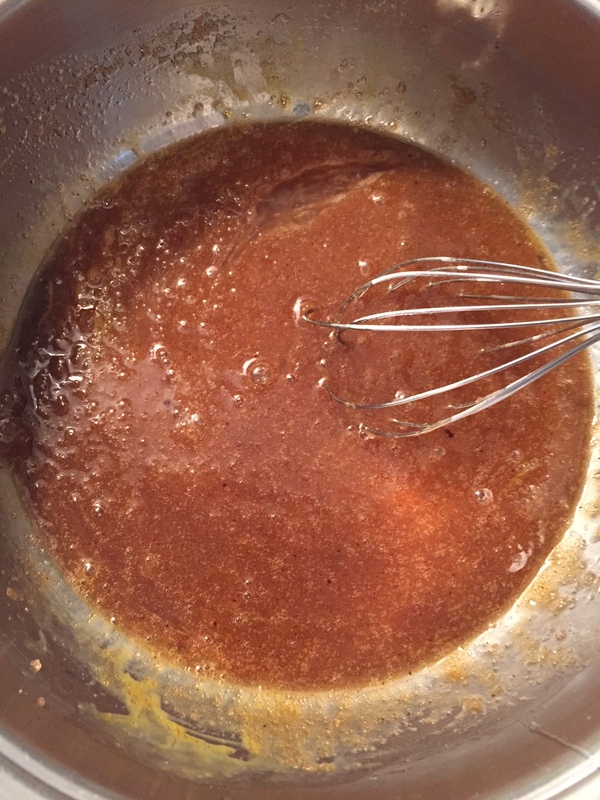 Remove from heat, whisk in brown sugar, and let cool for 15 minutes. 3.) 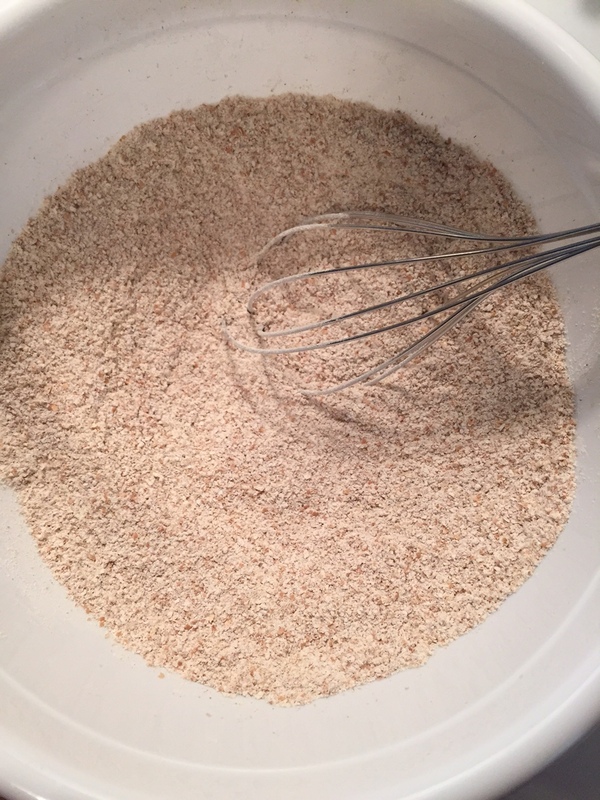 Whisk flour, baking powder, and salt in a medium sized bowl. 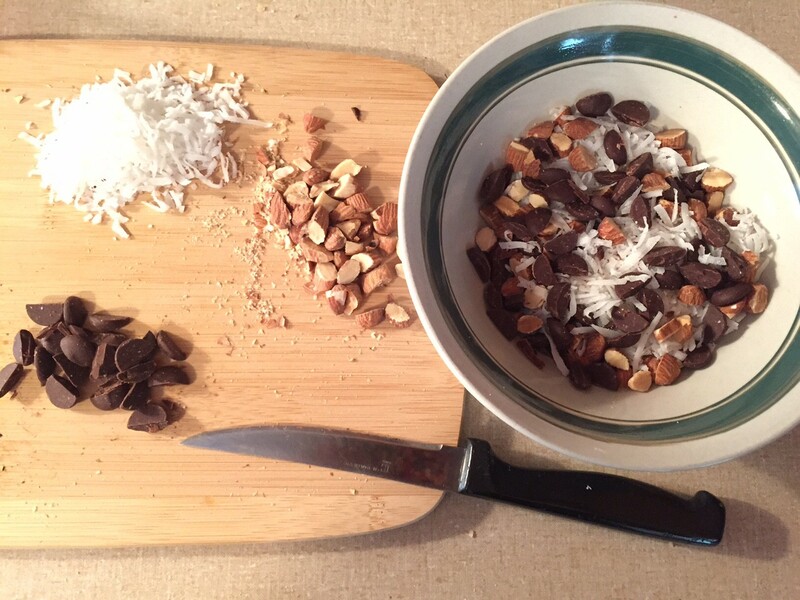 Prepare mix-ins by chopping nuts and chocolate chips into small pieces. Reserve 2 tbsp of each. 4.) 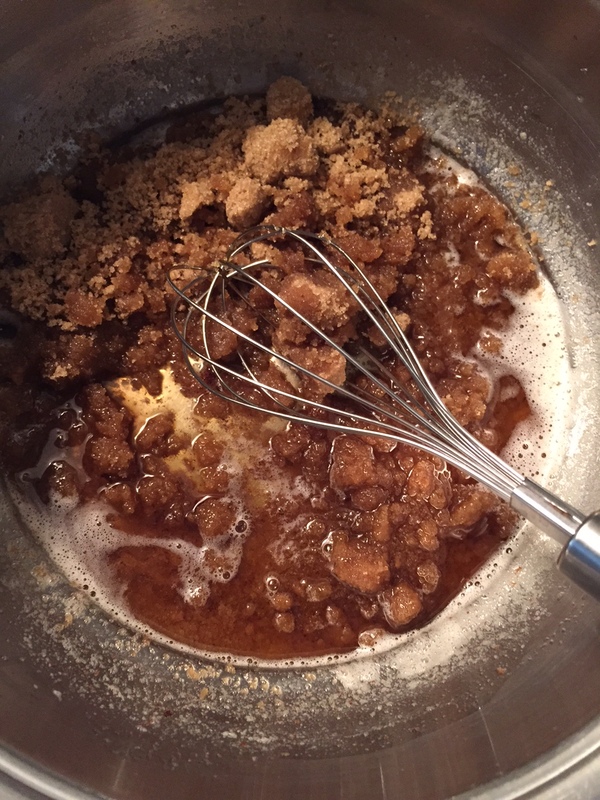 Once butter mixture has cooled, whisk eggs and vanilla into mixture until combined. 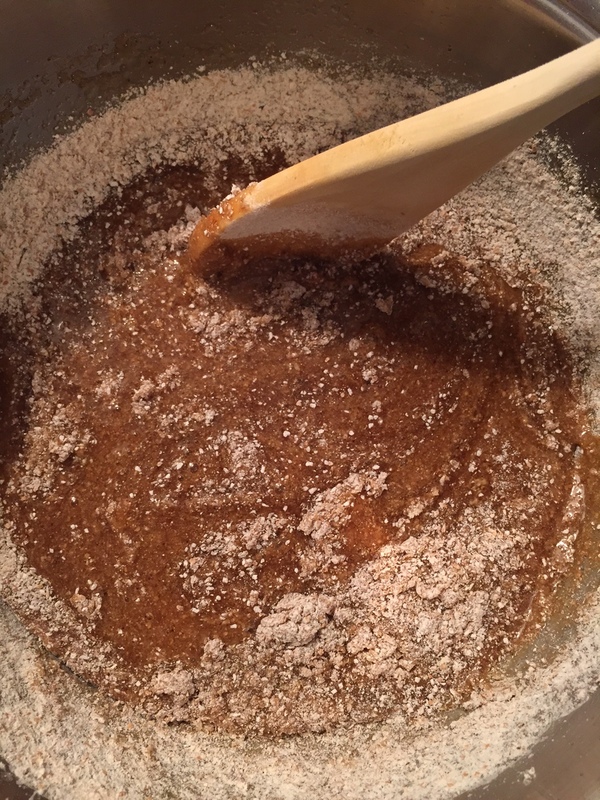 Fold in the flour mixture in 2 additions until just combined. 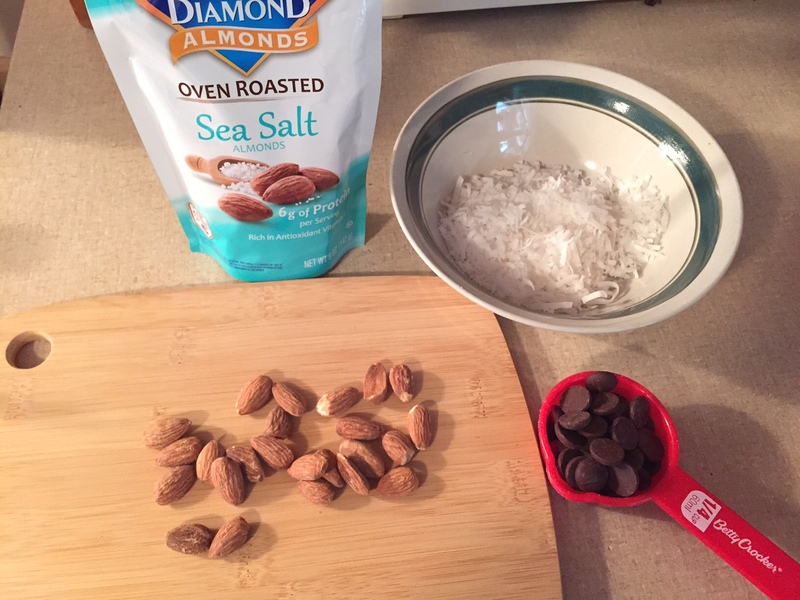 Fold the coconut, chocolate, and almonds into the batter and spread evenly into the pan. Top with the reserved mix-ins. 5.) 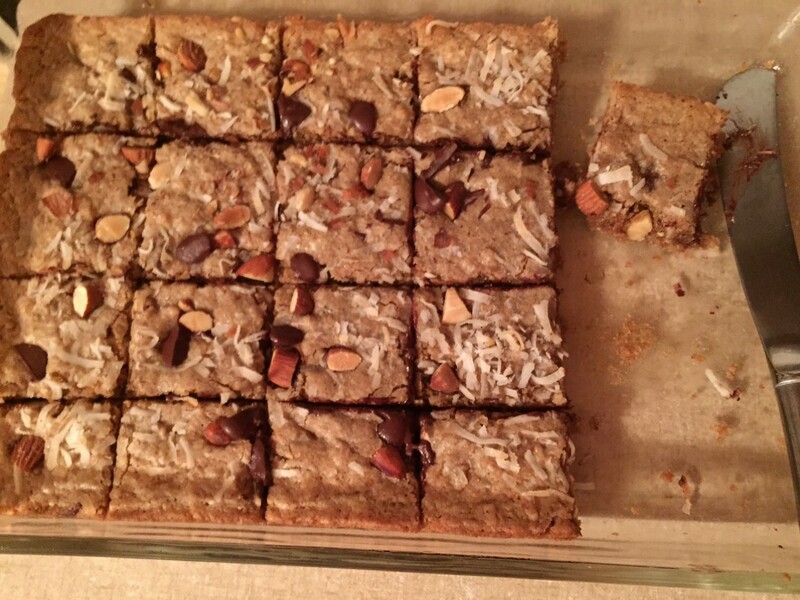 Bake the blondies until light brown around the edges, around 18-20 minutes. 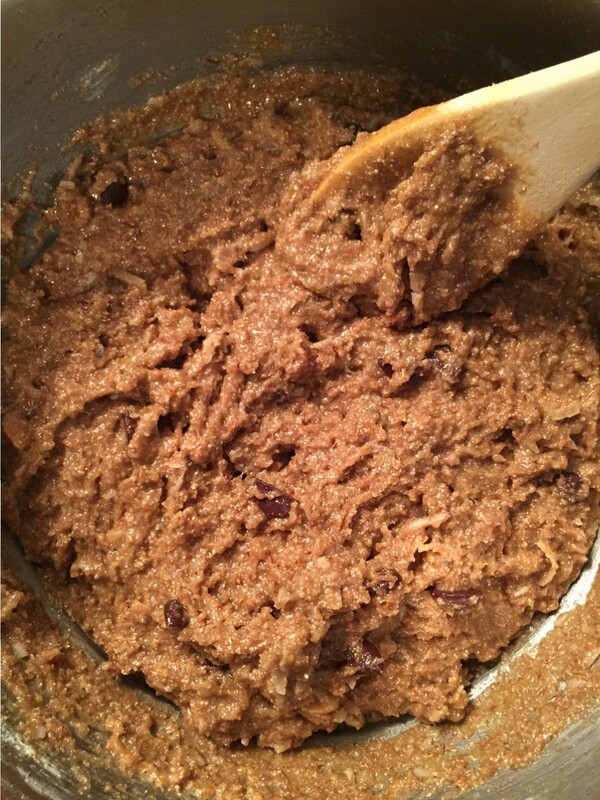 They may appear a little underbaked in the center, but will become firmer as they cool. 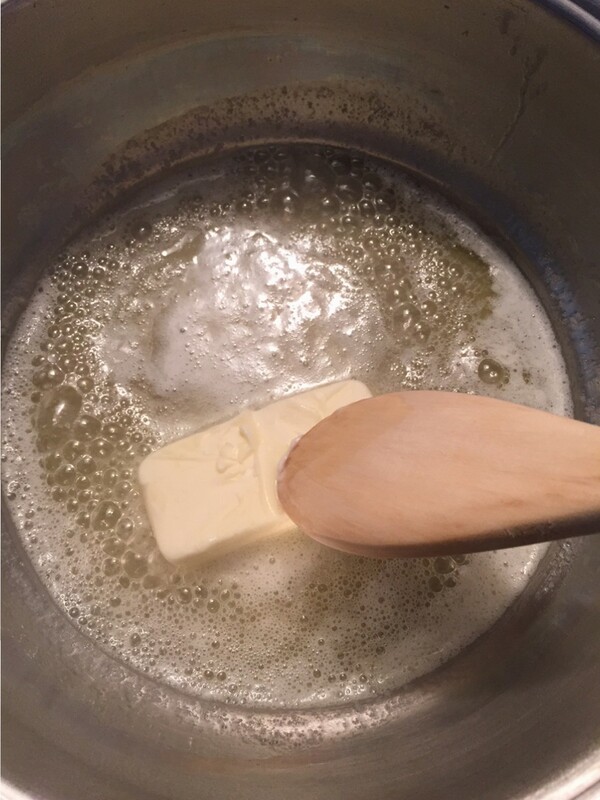 Leave the pan on hot plates or a wire rack to cool completely for about 2 hours. 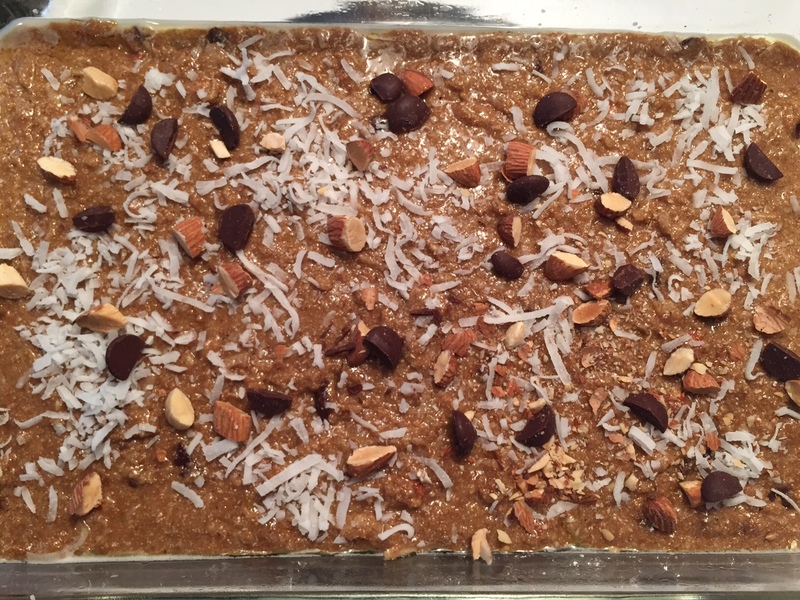 Cut into 24 bars.